High on Sugar [v3.0] [Dec 24,2015] Add: a little Xmas CUSTOMIZATIONS!! SEUS support - Darkder grass, sands, leaves. They'll no longer be so blinding. Illuminate enemy fixed. If using with puffy tress, please make sure this one is on top but below Green grass.. Here's something for you to kill time with, this texture pack still works with mc 1.5 - 1.7.10and will still work just fine after you install MCPatcher for mc1.8. All new presentation videos and screenshots are also postponded until the release of MCPatcher 1.8. I've received many reply that this texture pack is really lagging. It is due to the fact that this pack is really graphic heavy, it may require a better spec PC in order to run this pack smoothly. This is High On Sugar 2.2 that should covers things those were added, unless I forgot to note them down. Custom models for reeds/sugarcanes and slime Block. 1.8 blocks, entities, item icons, mobs. Ctm supported random blocks for dark oak doors, spruce leaves. Torch for changed from a something stick of heart to little candy, which I think it's alot cuter for decoration. Underwater should be more clear now. Chicken, cutify the wings abit. Darken the colors of netherack, quartz_ore, soulsand. More refined gravel block design. Soulsand redesigned into strawberry waffle. Spong redesign, pretty much all the blocks with old chocolate chip cookie texture have been redesigned. Daylight detector redesigned to match the other tool blocks old version included with _alt. Oak and big oak wood blocks traded eachothers' tones, big oak is now darker. big oak wooden planks are now darker as well. Glowing parts of enderman, spider, cave spider, ender dragon. Steve size, the human head should work properly now. The custom colors and random blocks/mobs will not be working properly due to the lack of MC Patcher. Other than this, if you encounter any problem, please list them into the reply below. Water - improved colors and particles. Random mobs - over 30 custom mob skins added!! Redstone lines - moreeeee sparkles! Saplings - are alot more kawaii now -cough-, added the jungle saplings. Why is Custom colors not working? Why is Minecraft lagging so much while I'm using High on Sugar? This pack is somewhat graphic heavy with custom models, animations, and extra random blocks/mobs. You might need a stronger computer to run this. There are 3 places you can get this texture pack from, Curse, Planetminecraft and Mediafile, if none of them work I suggest you check on your firewall/antivirus and your own connection. They work for majority of people so it's something you may have done wrong. I put the resource pack in the folder but it doesn't work! Re-watch the and actually follow it step-by-step, slowly this time, STOP SKIPPING THROUGH IT!! If you're using an up-to-date version of Minecraft, it WILL WORK properly. since there’s already [i]MANY[/i] people who [i]STOLE[/i] my pack and converted it and upload it [i]WITHOUT MY PERMISSION[/i]. (So far there’s only 1 person who asked to convert my pack a year back and I already gave her the permission. I have not heard anything else afterward). Also most of the custom animations and random blocks don’t [i]even work on Pocket Edition. [/i]So if you enjoy using the stolen [i]broken bootleg version of High on Sugar[/i], be my guest. I’ll not take responsibility of any problem it has cause. If you wanna try to convert it, go ahead, I WILL NOT HELP YOU. yes I'm fricken salty at this point. DEAL WITH IT. The shader customization doesn't work! Of course it's not going to work if you don't have any shader installed! This customization is a support for people who use lighting shaders that brighten up the pack GREATLY! So it provides the darker variations of blocks so they wouldn't blind you. opl's Model Creator : used for creating custom blocks! And everyone who liked this texture ever since I was just teasing. My friend Mumi and people from my private server, Bliz, Cody, Nezz. Gamingclone for super great support! Great, now I have diabetes and I didn't even need to use it . Create connected textures support for the mod included with Optifine or turn the feature off. I'm not sure if Optifine has custom colour support for all blocks but I know MC Patcher does. Awww, this is lovely, can't download it though... 4shared wants me to register. Could you add a mirror? Looks pretty awesome, the site you have it hosted on is horrible tho. I have to sign up to get a file? Thanks guys I've just moved it to Mediafire. Ever since I saw this pack pop-up on Tumblr I have been impatiently waiting for it's release. Thank you for this overload of sugar. My cake-themed worlds will look even more delicious now. Holy fish paste! You resurrected Candycraft and made some improvements! This looks amazing, and the presentation is totally professional. EDIT: The glass panels are kinda derpy, though. Double Edit: Hhehehe. Sorry, I was wayyyy to eager to download this, that I missed the FAQ. Sorry 'bout that. Made an account just to ask a quick question, haha. Love the texture pack, very cute! You did a great job! But the lighting seems a little strange when indoors. 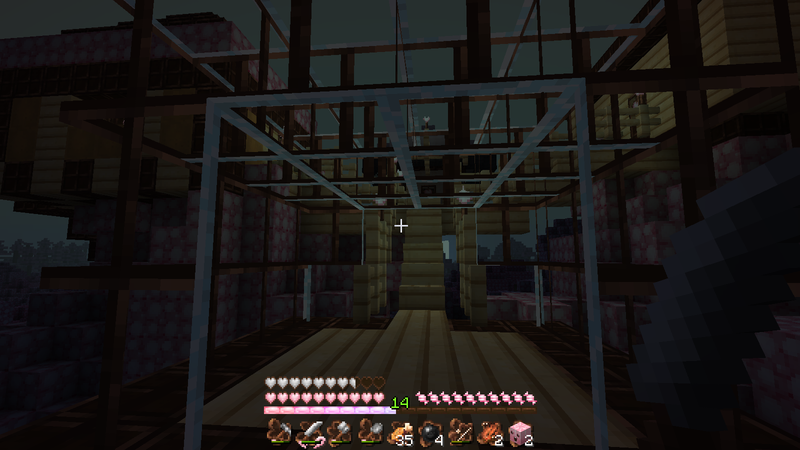 It's very dim, even with glowstone or torches placed. Am I the only one with that problem? Now that you mention it, it is true! Every time I go under a tree or inside of my house, the screen darkens considerably. Can it be intentional? Thank you so much guys XD! I'm glad you're enjoying this. For some reason it's doing that because you altered the color of the viginette. I removed them from the pack and nothing is dark now. OOO thank you ^o^/ I'll fix it asap! Just a heads up with the vigniette. The brighter it is, the darker it will make your game. So solid black = No unnecessary darkening. So you got it backwards in the pack. One more thing - aren't the stone and iron tools mixed up? 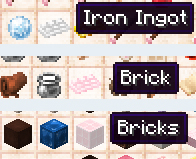 The iron ingot is pink, but the iron tools are not. Ohhhh thank you about the vigniette! The Next version I think I should make it all black so there won't be dark border. the pink one is the brick for pink chocolate bricks block. But, the confusing thing might be the armor and iron block in solid pink. I shall add this on next release, I'm terribly sorry!! I have a feeling that this is quick on the way to becoming a popular and very well known texture pack.